Morag Joss is the award-winning author of the Sara Selkirk novels, Half Broken Things, Puccini’s Ghosts, The Night Following, Among the Missing (Across the Bridge) and Our Picnics in the Sun. She has also written for television, and writes short stories for print and broadcast. Her prizes and shortlistings include the CWA Silver Dagger, the USA Edgar Award for best novel, and a Heinrich Böll residency on the island of Achill, Ireland. She holds Fellowships at Reading University and Southampton University and also teaches Creative Writing for Oxford University. She is a regular tutor for both the Arvon Foundation and the Scottish Writers Centre at Moniack Mhor. 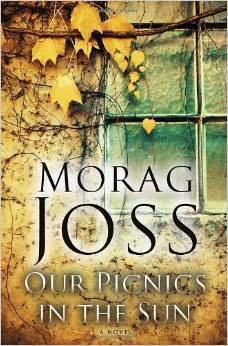 Morag Joss’s latest novel Our Picnics in the Sun is now available in hardback and e-book, published by Random House USA. It was a featured book on Entertainment Weekly’s ‘MUST’ list, and named as a Book of the Year by the Sacramento Bee. Our Picnics in the Sun tells the story of Howard and Deborah Morgan’s life on their Exmoor smallholding in the years following their failed return to the land. Surrounded by the decay of home and homestead, overgrown fields and ageing livestock, Deborah hangs on, caring for Howard who has been incapacitated by a stroke. She hopes against hope that their son Adam will spare enough time from his big corporate career to put in an appearance, perhaps on his birthday. He doesn’t. But Theo, the mysterious young man who appears instead, and whose presence (in Deborah’s mind at least) comforts her in Adam’s absence, also forces an unbearable past to the surface. Can a life with any meaning be salvaged from the wreckage of destroyed faith? This novel asks how – indeed if – love can survive the aftershocks of vanished loyalties and lost chances.